This one pot spaghetti dinner includes extra water, which the pasta will absorb as it cooks. It's an easy one-pot dinner and makes a tasty and satisfying family meal. 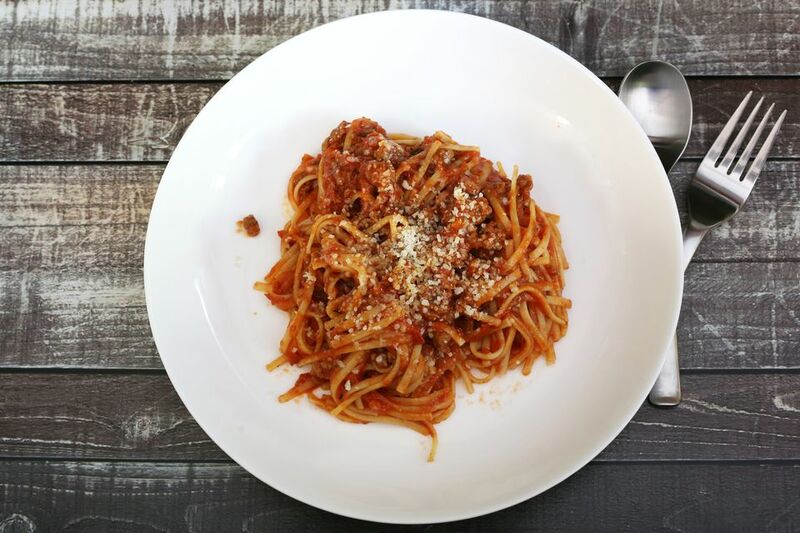 The fact that the spaghetti cooks in the same pot with the sauce mixture means that there are fewer pans and utensils and less cleanup, a welcome bonus when you have a busy schedule, and there's no need to drain the pasta! You can vary the ingredients to suit your taste. Add about 1/2 cup of chopped bell pepper to the pot along with the onion and garlic. Mushrooms are an excellent option as well. If you're feeling a little sneaky, add a shredded carrot or small zucchini; the kids won't even notice the additional vegetables in the sauce. And with plenty of veggies in the sauce, you could even omit the meat. For an extra-meaty sauce, use 1 to 1 1/2 pounds of ground beef. Italian sausage is a good alternative to the beef, or use part Italian sausage—removed from casings—and part ground beef. Ground turkey is another possibility if you prefer to limit your red meat. If you like your spaghetti on the spicy side, increase the cayenne pepper, or add 1/2 teaspoon to 1 teaspoon of crushed red pepper flakes. Serve the spaghetti with slices of toasted garlic bread and a tossed salad. Heat the olive oil in a large saucepan or Dutch oven over medium heat. Crumble the ground beef into the pot and cook for 2 to 3 minutes, stirring frequently. Peel the onion and garlic. Chop the onion finely and mince the garlic. Add the onion and garlic to the ground beef. Continue to cook until the onion is transparent and the beef is no longer pink. Drain and discard excess fat. Add the cayenne pepper, basil, and oregano; stir to blend. To the beef mixture, add 2 cups water, the spaghetti sauce or marinara, tomato paste, and the uncooked spaghetti; bring to a boil, stirring frequently. Reduce heat to medium-low and simmer for about 12 to 15 minutes, or until the spaghetti is just tender and most of the liquid has been absorbed. Turn off the heat and cover the pan; let the spaghetti stand for 5 minutes. Taste the spaghetti and season with salt and pepper to taste. Serve the spaghetti sprinkled with Parmesan cheese and provide extra Parmesan cheese at the table.